I have been trying to learn how to drive for a long time – I actually had to renew my provisional license! After moving around a lot and trying to learn how to drive I had almost given up. I decided to look into an intensive course in the Borders area, and LDC came up in my search so I contacted the number online for my area. The website was great; it gave me all the information about the course that they offer and who your instructor is for that area. I didn't hesitate to get in touch with Dave and discuss things further. He gave me all the information about semi-intensive and intensive courses and very quickly had me book my first lesson to assess my skill level. After my first lesson with Dave, he had already taken me further than I'd been after 4 lessons with a previous instructor in the area, so this immediately gave me the confidence I needed to push forward. 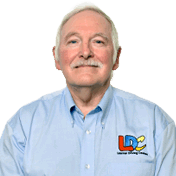 On my next lesson, I purchased the LDC workbook and DVD to start going through the semi-intensive route with Dave. These tools are great for students who need that little bit extra before getting into the car each time. You are definitely in control of your own learning and you need to own organising the time to study before your lessons and listen to Dave if he wants you to study up on a certain area as this will be your next lesson so it works hand in hand. Without the book and DVD, Dave is still a fantastic driving instructor. He has a lot of experience and has been the best instructor I've had over all the years I've been trying to pass (20 years!) He is very patient and never loses faith in your ability to progress. During every lesson, I would learn new skills and perfect the ones I had already practised. He would always praise anything I did well, which made me realise I was a good driver sooner than I thought. If I had any issues we would always talk things through and he is very good at explaining things. Dave was always professional and on time. He communicated through text or calls which I found easy to manage and he will always do his best to fit you in around his very busy schedule. Dave never let me down and I always knew I could rely on him. Dave arranged my test date and made sure we had plenty of time beforehand to get lessons in and practice which put my mind at ease. On my test day, Dave was very good at keeping me calm, going over things with me to make sure I was comfortable with all the aspects of the test. The book and DVD include everything as well, and some of the material was word-for-word how Dave would explain it so I feel this helped me loads as it was never worded one way in the book and a different way out on the road. Whilst driving during my test I could hear Dave's voice in my head willing me around how to do things correctly and that is a sign of a great teacher. 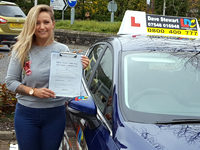 I can't thank Dave enough for supporting me through the whole process from start to finish – he is an amazing driving instructor and LDC are very lucky to have him! I would highly recommend Dave to anyone who is looking to pass their driving test!